The famous iconic lighthouse of Tomo. 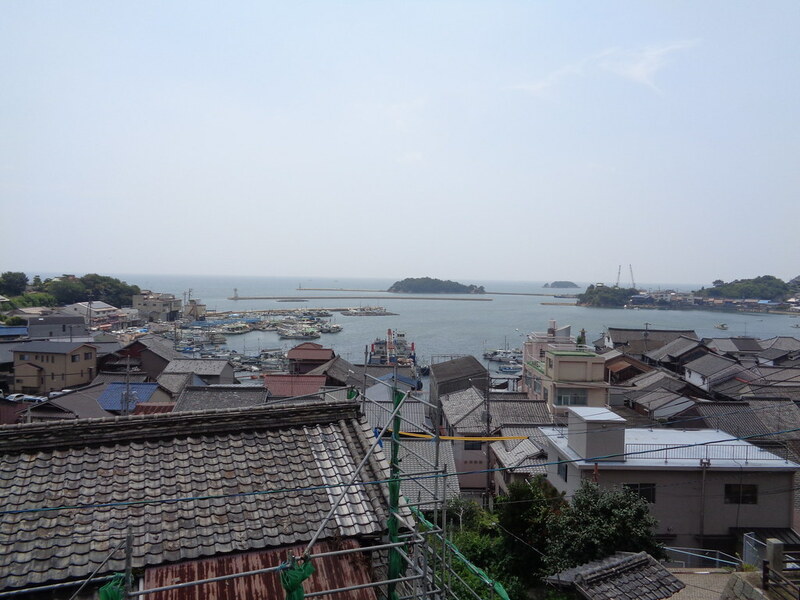 The next day, we made the two-hour or so drive to Tomonoura, another one of these Inland Sea port towns. Tomo is one of the more famous ones, around the country, whether simply as a tourist destination, or for its role as the inspiration for Ponyo Ponyo. Apparently, a number of live-action films have also been filmed there, including Logan and Gintama, using the town’s traditional architecture for backdrop. Our first stop within Tomo was Komatsu-dera, a small Buddhist temple where a member of the 1790 Ryukyuan mission, Yoseyama peechin Shô Dôkyô, was buried. 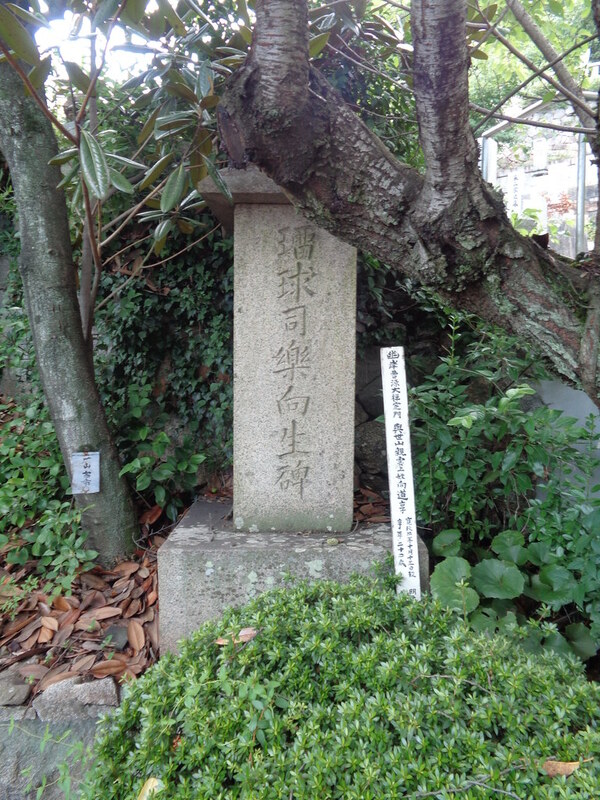 Right: The stone marking the former gravesite of Yoseyama peechin Shô Dôkyô, at Komatsu-dera. Traveling to Edo as a musician at the young age of 22, he fell ill aboard ship, and died on 1790/10/13. He was, sadly, one of a few tens of Ryukyuans to die over the course of the missions. Later missions made a point to visit the graves of such individuals, to pay their respects. The body has since been removed to Okinawa, but a stone marker still stands at the temple today marking the former site of his grave. 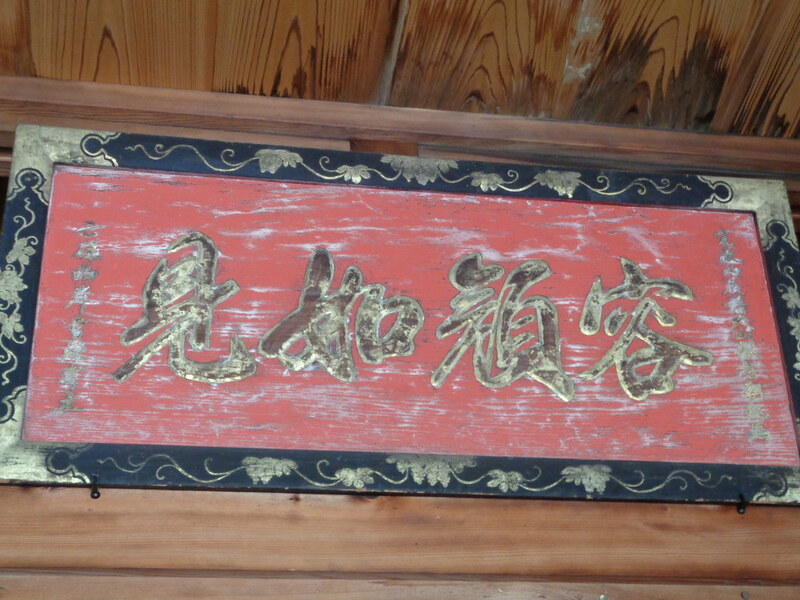 Further, a wooden plaque still hangs inside the temple’s main hall, inscribed by Yoseyama’s grandfather. It was really something to see these things, these artifacts, which I had been reading about for so long. Plaque (hengaku) inscribed by Yoseyama’s grandfather Fukuyama Chôki, reading 「容顔如見」 (roughly, “his face appears before me”), and still hanging inside the main hall at Komatsu-dera. View out over the town and harbor, from the former site of Tomo castle. Now, the site of the Tomonoura History Museum. 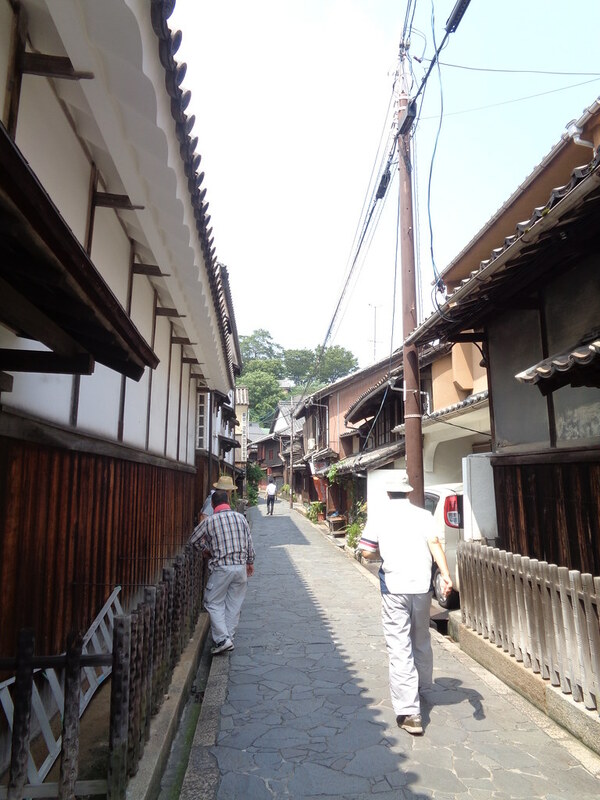 Walking through the small streets of Tomo, many of them lined with traditional-style buildings, cute shops, and so forth, we trekked up a hill in the center of town to the former site of Tomo castle. Through the Edo period, this did not function as a true castle – there was no daimyo here – but it did house the residence and offices of the Tomo Magistrate (Tomo bugyô), an official appointed by the daimyo of Fukuyama to oversee the town, and especially matters of trade and travel, who was coming in and out of the port. Today, there is basically nothing at all left of the castle, but the local history museum stands on the site. I was annoyed to once again find myself in a local museum that doesn’t allow you to take photos. And they don’t publish a catalog either of the permanent exhibits – so the only option is to painstakingly write down everything on the labels, and commit to memory the images of what the museum looks like, how it’s arranged, what the individual objects look like… I hate it. But, still, it was cool to get to visit, to learn something about the history of the town. My friend got into a really lengthy conversation with the curators, and was lucky to have them offer to give her a copy of one of their exhibit catalogs – an especially rare book that can’t be found in any used book stores, and which I’ve been sorely looking for myself. Oh well. Maybe next time, I’ll go by myself, and they’ll be impressed over again by how knowledgeable and interested this random foreigner is, and they’ll give me a copy of the book. I feel like most of the documents they hold at the Tomo museum I have already seen in reproduction or transcription, so there’s not necessarily too much need to try to set up a real appointment to see the originals. But still it might have been nice. Maybe next time. I did get some good notes from the gallery labels – learned just a few more points to fill in a few more small holes in my work. We then headed back down into town. Tomonoura, like Mitarai, has lots of quaint, small walkable streets of traditional machiya-style shopfronts, perhaps even moreso than Mitarai, and it’s just nice to walk around. We found one shop selling tai-miso – that is, miso paste made from sea bream (fish) instead of from soybeans or whatever. Weird. But a very traditional way of running the shop, with a sort of showroom in the main front space, and no shelves to just walk among. Customers walk in and sit on benches, while the staff person sits on a raised tatami-lined section of the floor. A very few samples are placed out on display, and in order to buy anything, you engage with the shopkeeper, who offers you tea and samples of the miso, and you really talk to her and try out the goods, before deciding what you want. Some of the equipment they were using – such as the rotary landline telephone – were also quite old, like stepping back into the Shôwa period, if not quite into the Edo. And, incredibly, she said she left her husband and children back in (I forget where, Tokyo? Osaka?) to come down here to Tomo to work. Presumably she visits every weekend, or something like that. What a job, what a career, to choose to focus on like that! The interior of the above shop. 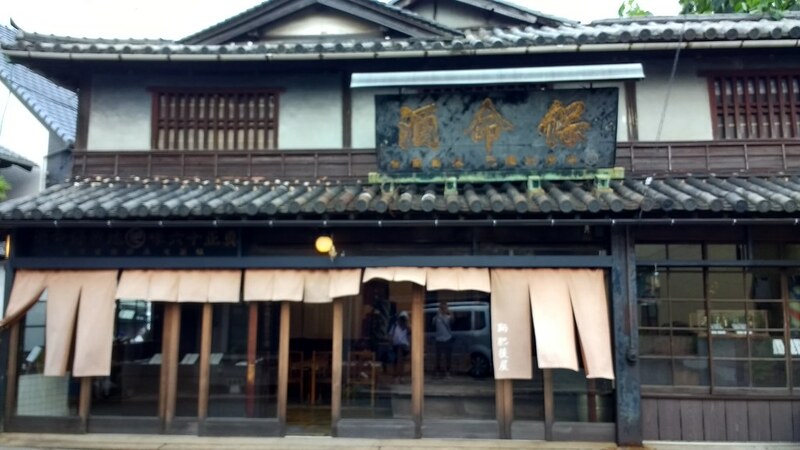 Tomo is also famous for its homeishu (lit. “protecting life wine”) – a liquor brewed with tons of spices, that’s supposedly supposed to be good for your health. Reminds me of how Coca-Cola and certain other soft drinks were marketed at first. Homeishu goes back hundreds of years, and the Dutch, Ryukyuans, Koreans, as well as various daimyo put in orders to be able to take bottles with them when they passed through Tomo. The Nakamura family, who used to be one of the most famous, most prominent purveyors of homeishu, are no longer in business. But I bought some homeishu from another shop – here’s hoping it’s “authentic”, whatever that means, with some real connection to historical recipes, and not just some tourist garbage. 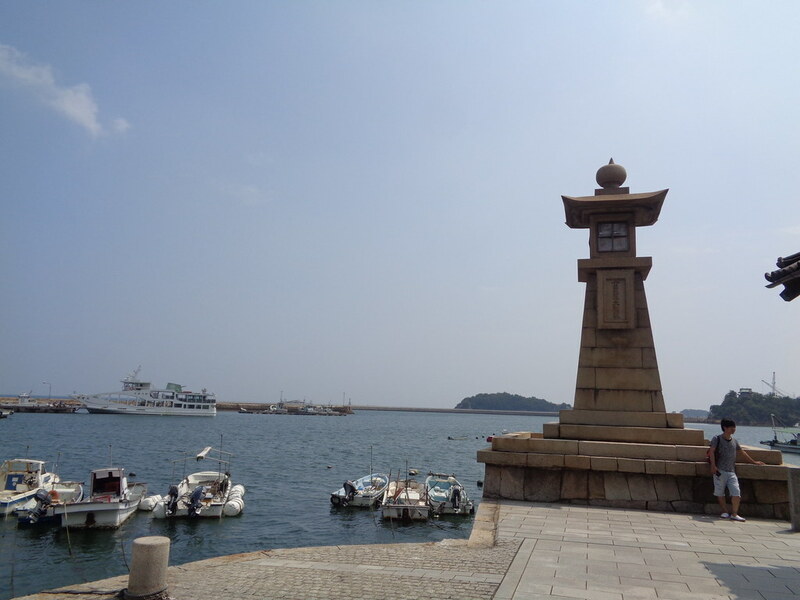 Many of the key historical sites in Tomo are clustered around the harbor, where the land sort of comes to a point, or a spit, with an iconic, famous, large stone lantern at the end. It was really something to see this after reading about it, and seeing it in pictures, so many times. Mitarai and Kamagari have this too. One of the main streets of Tomo, with the Ôta family house on the left, and Chôsôtei on the right. My main number one destination in mind was the old Nakamura family house, now known as the Ôta family house. 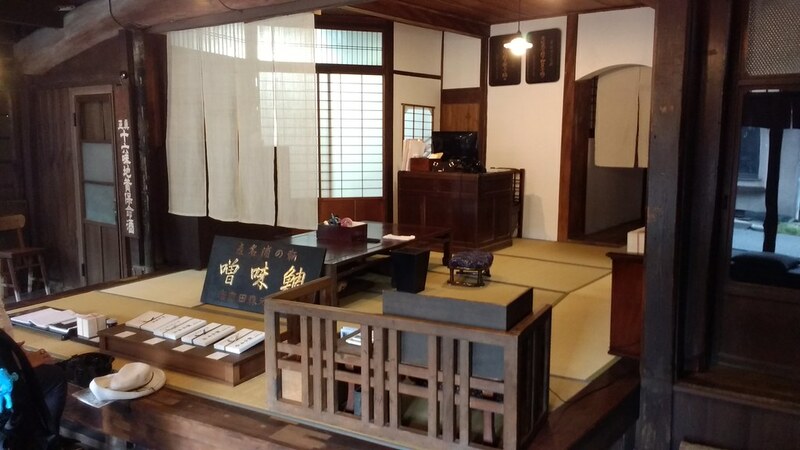 A nationally-designated Important Cultural Property, the house, along with the Chôsôtei building across the street, served as the honjin or chaya, one of the main elite lodgings for the port town, in the Edo period. I don’t know precisely what we would have seen had we gone inside, how revelatory it would have been – likely not all that much – but, this is where the Ryukyuans would have stayed when they stayed in Tomo. Depending on how it’s done up, how the displays are done, we might have gotten to see a real sense of what their accommodations looked like, and how they were arranged, which could be quite nice for my dissertation. Sadly, however, they’re closed on Tuesdays. (grrrr) We of course should have looked into that earlier, and prepared properly for it, but, still, I was *super* bummed. If not for the typhoon, our schedule might have played out differently, and we might have ended up in Tomo a different day. Of course, if it were a Monday, the Ôta house would have been open, and the history museum closed. And, apparently, for some reason, the Chôsôtei is never open to the public. So, whatever. I’ll just have to go back another time, and prepare more properly that time – scheduling out which days they’re open, and also emailing or calling ahead to see about the possibility of getting special access to the other building, or to documents, or something. Incidentally, I’m not sure if it’s the exact same Ôta family house, but somewhere right in this area, is where seven Kyoto court nobles came and stayed for some time in Tomo, in 1863, after being expelled from Kyoto for plotting against the Shogunate (and the Court). Other buildings very nearby right around Tomo’s port area are associated with the ever-present Sakamoto Ryôma, who accidentally crashed his ship, the Iroha-maru, into a Kishû Tokugawa vessel, in the waters off Tomo in 1867, and who then stayed in Tomo for a time while negotiating for reparations. Or something. I have little patience for Ryôma – so over-lionized, so over-discussed, as if he’s some incredible legendary hero. He’s a historical figure like any other, who said and did and was involved in some really important or interesting things – but as an individual, as a figure, I just don’t subscribe to that form of history fandom. The view out from the Taichôrô at Fukuzen-ji, a view that one Korean envoy called the most beautiful view in all of Japan. Making our way around the harbor to another part of town, we visited the Buddhist temple Fukuzen-ji, famous for its Taichôrô (“Tower Facing the Tides”), a guestroom explicitly constructed as such, to welcome and host elite figures such as Korean envoys. 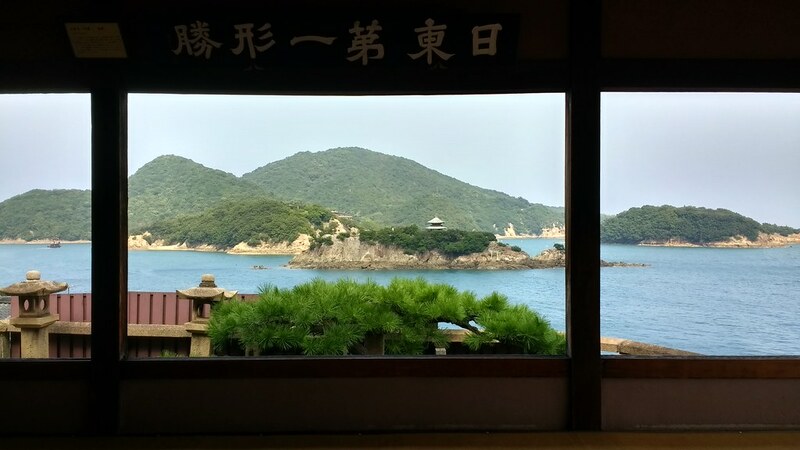 Here, we saw a gorgeous view of the Inland Sea, which one Korean envoy back in 1711 described as the most beautiful scenery in all of Japan. And we also got to see some displays about the Korean missions – mostly news clippings, photocopies from textbooks, print-outs of copies from museum catalogs, that sort of thing, along with some genuine artifacts from the temple. I suppose the Korean envoys were housed right in that room – I could see that being the case. Large tatami room, just throw down some futon, bring in some small lacquer tables or whatever… not sure what I’d expect an elite guestroom to look like, to be honest. But that was about it – I might have liked to see a bit more about exactly how they were housed, but, no such luck. Still, it was some comfort, after not being able to get into the Ôta family house, to at least be able to see this space, and all the displays there. Tomo was the last of the port towns we visited. I had considered trying to visit others to the west (e.g. Tsuwaji and Kaminoseki), or to the east (Onomichi, Murotsu, Kobe, Osaka), but it just didn’t happen this time. Still, the adventure wasn’t over quite yet. In my next post, the last in this series, I’ll talk a little about Fukuyama castle, and my last day in Hiroshima.